Bar, Restaurant & Banquet Hall items - HOF Chophouse in Green Bay, Wisconsin by Massart Auctioneers Inc. When registering as a new bidder the credit card you register with will have an authorization done.The credit card used for registration will be charged following the auction unless you specifically call us ahead of time to arrange for different payment. If alternative payment is approved we accept cash, good check or a seperate credit card.15% Buyers fee plus applicable sales tax.$10 Handgun transfer fee for each handgun purchased. All FFL Rules & Regs apply.This auction features an auto bid extend. Auction end times: Massart Auctioneers Online Auctions are timed events and all bidding will close at specified times. 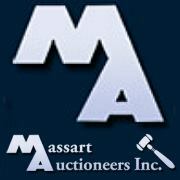 Massart Auctioneers Online Auctions also have an auto extend feature. When a bid is placed in the final 2 minutes of bidding the auction bidding will automatically be extended 2 minutes from the time the bid was placed. ie: If an auction is scheduled to close at noon, receives a bid at 11:59 the close time will automatically extend two minutes. The auto extend feature remains active until no further bids are received within a 2 minute time frame.The first item is scheduled to close at 3:00pm(central) on November 11. Items will close every twenty seconds after that unless the auto extend feature kicks in. ie: The second item will close at 12:00:20, the third item closes at 12:00:40.Massart Auctioneers Inc does not test items for genuineness. All descriptions are believed true, inspections encouraged.Measurements are approximate sizes.You are bidding on the described item, not the photography. On occasion the wrong photo may be displayed, always read the description.Any items left behind after the specific date or dates will be considered abandoned and will be forfeited unless alternate pick up or shipping arrangements were made prior to load out.If you plan to have us bring your item or items back to our office, please email or call us. Please note this service is NOT free.Massart Auctioneers staff does NOT move, carry or load items for you. You must provide any packing material or boxes needed for transport of items.FAILURE TO PICK UP ITEMS ***This pertains to auctions located at the 2545 Finger Road address. - Buyers who fail to pick up their purchases on load out day will be charged $5 per item on smaller items and $25 per item on larger items for removal.FAILURE TO PICK UP ITEMS ***This pertains to auctions located at any address other than 2545 Finger Rd. Buyers who fail to pick up their purchases on load out day will have their items forfeited. Charge backs are NOT permitted. If you miss the pick up opportunity your items have been abandoned by you. You MUST make arrangements with us prior to auction load out if you cannot make this time. * All items sold "AS IS, WHERE IS" with all faults. * No implied or express warranties. * All descriptions believed accurate but not waranteed. * Bidder inspection is encouraged. * By placing a bid, bidder signifies that they have examined the items to their satisfaction, or that they have chosen not to personally examine them. * Massart Auctioneers Inc reserves the right to reject any bid at our sole discretion. * Applicable taxes of 5.5% sales tax will be charged unless a sales tax exemption form is provided. * Buyer's premium of 15% will be charged. * In the event of failure of the online bidding system or other technical failure, Massart Auctioneers Inc reserves the right to cancel and/or reopen the auction.The bidder contract entered into between the bidder who name is registered to this account and Massart Auctioneers. Bidder and auctioneers agree that the terms listed below shall govern this auction.1. Full payment shall be made before any items leave the premises.2. Terms of auction: Unless auction is announced as absolute the auctioneer/auction firm has the right to reject any and all bids. The auctioneers/auction firm further has the right to bid on behalf of the buyer, the seller, or on their behalf. Auctioneer/auction firm reserves the right to divide any lot, to combine any two or more lots, or withdraw any lot or lots from the auction. Payment for purchases must be made according to terms of each particular auction. All checks must be made payable to Massart Auctioneers. A Buyers fee will be added to bid price to arrive at the sale price. Any sales tax would be figured on this final sale price. All sales are subject to State Sales Tax Laws. Bidder agrees not to stop payment on checks or disallow a sight draft and is responsible for any expenses due to collection of bad checks. Bidder agrees not to pursue chargebacks on any credit card payments.3. NO WARRANTY: The descriptions of items in this auction are believed to be correct. Never the less, neither those descriptions nor any oral statements made by Owner, its Officers, Agents or Employees of auctions concerning any item shall be constructed as a warranty, either express or implied. ITEMS ARE SOLD AS IS - WHERE IS. I, the buyer, have examined this merchandise adn accept it the way it is.4. SETTLEMENT: Must be made at the conclusion of the auction. Nothing is to be removed until settled for. Merchandise becomes the full responsibility of the Buyer at time of purchase, and Buyer assumes all risk of loss and damage to property. Owner and Auctioneers agree that merchandise may remain on the auction premises for a period of time following the auction. The date by which all merchandise must be removed from the premises will be announced by Auctioneer.5. RESALE: Auctioneers reserve the right to resell any property not paid for in full on auction day. The Buyer shall be responsible to Auctioneers for any expenses of resale and collection and damages resulting from the resale. 6. INJURY & DAMAGE:Bidder acknowledges responsibility for any personal injury or property damage caused by Bidder or his Agent, and further agrees to hold Auctioneers, Owners, its Officers, or Employees harmless for any personal injury to himself or his Agents and any property damage incurred on auction premises.7. By registering for this auction you give Massart Auctioneers permission to add you to their mailing list. You can unsubscribe at any time.